I realised over the weekend that it’s been a fair while since I updated the scatter graphics. 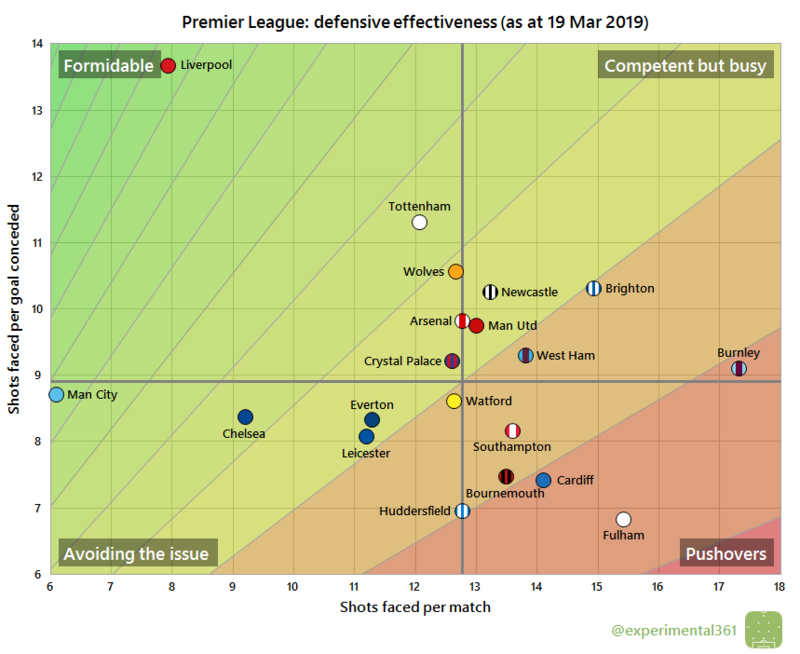 These compare the attacking and defensive performances of every team in a division. Each of the four graphics is explained briefly below and at length here. In raw shot terms it’s the same story as before Christmas: Man City tend to dominate matches and currently take over 10 more shots than their opponents on average. 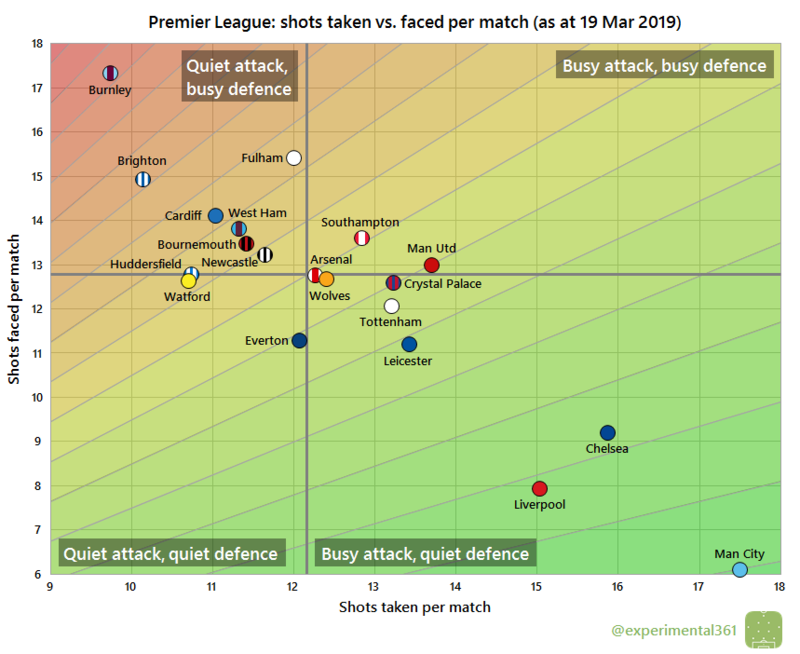 Liverpool and Chelsea are the only sides anywhere near as dominant, while Burnley stand out as the team who spend the most time on the back foot. It’s hard to say whether Huddersfield‘s season is more ruined than this graphic, but their eye-wateringly bad shot conversion is far from ideal either way. They’ve needed over twice as many attempts as the average team to score each league goal this season. Chelsea‘s desire to recruit another striker in January is understandable given their relatively average finishing this season despite having created all those chances – a clinical Arsenal side have scored more goals despite carving out far fewer opportunities. Despite having sprung a few leaks lately, Liverpool‘s defence still looks excellent overall. 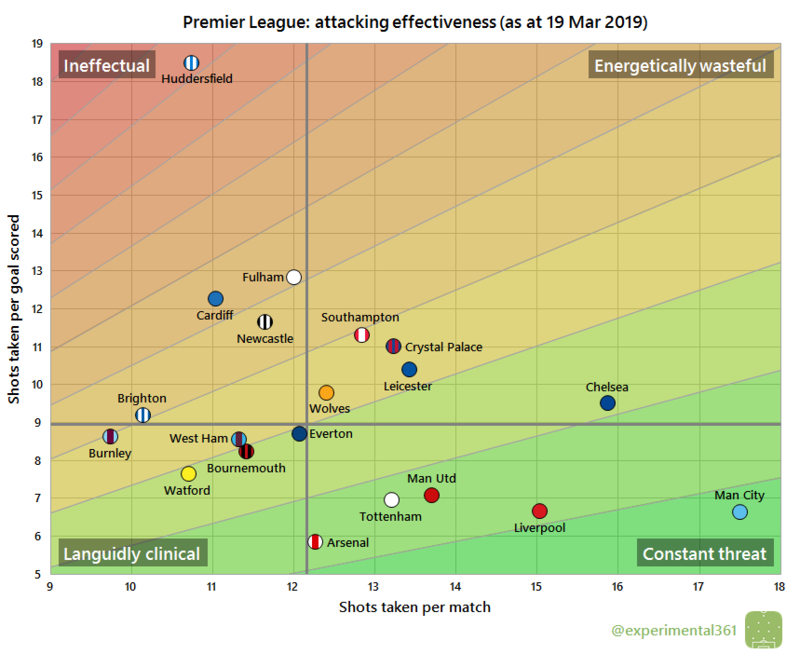 If the last chart wasn’t bad enough for Huddersfield, they’re also leakier at the back than anyone except Fulham despite allowing their opponents a relatively respectable number of opportunities (fewer than Man Utd for example). 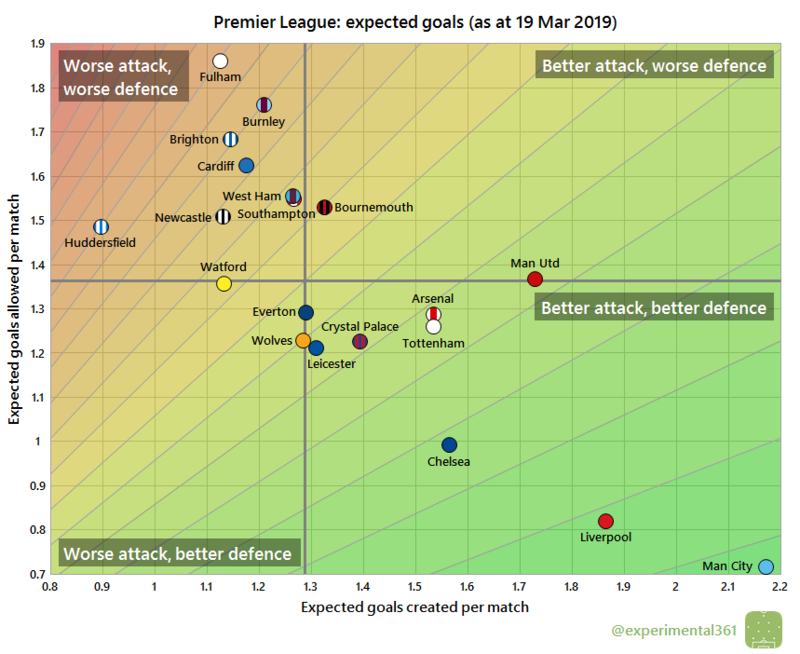 When we adjust for shot quality (at least as accurately as I can measure it), Liverpool are a lot closer to Man City overall, with Chelsea a clear third. Man Utd‘s problems seem to have had more to do with their defence than their attack, but overall they look stronger than they did before. Crystal Palace narrowly lead a clutch of four sides who are the closest to the established ‘big six’.